Only one adware I see is easy to untick during install propcess. 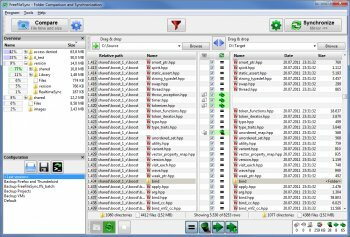 Excellent freeware file sync, easy to use, nice interface. I love this program! I use it daily. I do not have any adware problems. You must read all the instructions when installing! V7 installs Dragon Branch by default which takes over your browser inserting ads and likely is tracking you. The default should be not to install Dragon Branch and BOLDLY warn you it is taking over your browsers, piling in the ads and tracking you. This would and should be one of the best folder synchronization utilities available with one exception: There is no way to set a 'default' set of folders for the application to open up to. Instead, it opens to whatever two folders were last used. It stands to reason that a Sync Utility would either allow the user to choose the default folders, or at the very least open to the top level of folders on the two drives - e.g., C: and D:. In past versions at least the user could set the GlobalSettings,xml file to Read Only to get around this issue, but that is no longer possible. Includes "opencandy", so be aware during the install. I like it & use it. Easy enough to use & featured enough to meet my needs. Preview is very informative, letting me know exactly what's going to happen before it does.